Are you heading to Toronto’s One of a Kind Show this year? 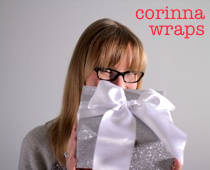 For the gift-wrapping obsessed, Saturday, Dec. 7 is the day to go. In addition, there are daily gift wrapping workshops with lifestyle expert Shoana Jensen, as well as a gift wrap centre where you can get your purchases wrapped. Check out the One of a Kind Show website or on-site show guide for more details. The One of a Kind show runs from today until Dec. 8.